Don't Eat the Paste: I got my new glasses! Usually I like buying my glasses in person, like most people, to be able to try on different pairs. But ordering online is a lot less expensive. I've ordered from ZenniOptical before, this time I wanted to try a different company. After doing some research, I picked EyeBuyDirect. If you decide to buy a pair of glasses from them after reading this, please use this code for a discount: IFF2MRR81T They have a loyalty program, and if you use the code, you'll get a discount, and I'll get a small credit on my next order. Style- They have nice styles, especially in the retro glasses my husband prefers- He rocks the Clark Kent look. They take PayPal. If you're an Etsy craft seller, work with sponsored posts, etc, you know PayPal is the currency of the land. The fact they take PayPal made them incredibly convenient. Now, my glasses don't have many special considerations. In fact, it's just one. I'm near-sighted, like a lot of people. But I'm incredibly near-sighted. Without my glasses, legally blind, walking into things, can't recognize my own children from 5 feet away near sighted. Which means that if I don't want to wear super thick glasses, they have to be a fairly high index which always costs extra. I also prefer larger glasses, lots of room so the frames aren't constantly in my field of vision. Sometime in the next couple of years, I'll need a second pair of glasses for close work since these correct too strongly for working up close, but for right now, my glasses are the first thing on in the morning, last thing off at night. 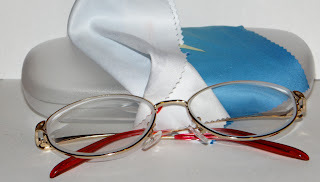 To pick the frames, I started by taking all the measurements from my old pair in millimeters. The height and width of the lenses, the width of the bar across the nose, the length of the temple pieces and the total width of the glasses. Then I started looking. Finding pairs I liked, comparing the measurements on those pairs with my current pair. The pair above was my final choice. Generally, with the standard high index plastic they use, they are 19.95 complete. With the upgrade for the super thin high index plastic (1.6) and a UV coating, they wound up being 58.50 plus 5.95 s&h. They *do* combine shipping if you're ordering more than one pair. They sent me regular updates about what was happening with my order, then sent me an update when they were sent. From the time ordered, until they arrived, it was less than 2 weeks. The glasses came with a hard plastic case that closes with a magnet and a cleaning cloth. The quality is very nice, better than my last order from ZenniOptical. Part of why I ordered from them was to check the quality before ordering glasses for my husband. He likes the quality and plans to order the Ronnie glasses which are a nice, black framed, retro look. First pair is free! Worth a try!